My brothers all wanted to take up hockey, so we all went out to buy skates, and I came home with the nicest pair. RBK 8k's - nicest skates at the time. What does that matter? Not much. To this date, I have only made it around the ice rink about 3 times, and with the help of those little granny walkers. hmmm.... so yes, I decided to paint them. I just LOVE the soft touch of the pink blade covers, and the purple silk fabric, against the hard tough skates. Yes, this is me. And these are, MY Skates. 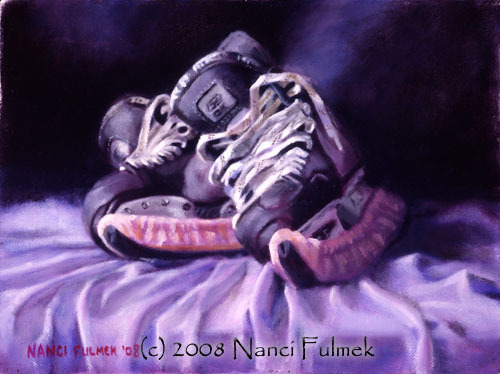 "My Skates" was chosen for the 2010 Patti's Choice show for the month of October at Robbin Gallery, in Robbinsdale, MN.